After travelling in three different crowded contraptions up the mountain, I found myself at the top of a narrow steep slope. Eighty or so pro skiers straight off the gondola are charging past me without a second of hesitation, whilst I stand there frozen with fear. Boisterous helicopters are landing left and right, shipping in experienced snow goers. It was a natural routine for most, but for a beginner like me, it felt like chaos. I was bombarded with noise, sounds and chilling winds - this wasn't my comfort zone. I was expecting shallow, wide fields of snow that I could easily cope with. I was very wrong. One thought became my mantra: There's only one way down. I just about composed myself and managed to make it down the majority of the steep slope in one piece. I didn't enjoy it (I was petrified and I don't scare easily), but I felt accomplished nonetheless. In the distance I saw a sharp fork right with a precipitous ramp leading up to a quaint wooden house. In order to make it up the ramp, you'd have to build up a huge amount of speed beforehand by going straight down the previous slope. My Dad and I share a look of excitement and we go for it, gliding down the mountain filled with adrenaline. It was a true Die Hard/ 'Yippee Ki Yay Mother F*****' moment. The glorious ramp took us to a restaurant known as the Igloo. It had sheepskin chairs and a charming wooden deck, and was completely isolated from everything else. It was the most beautiful restaurant, tucked away in the snow and hidden from crowds of people. 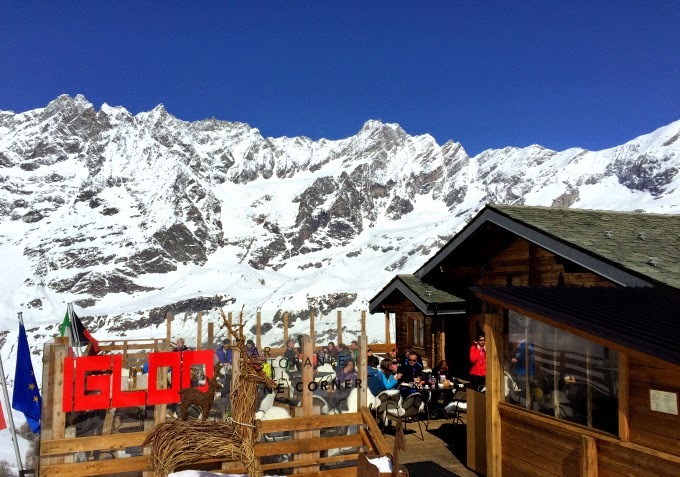 It's located on a red run from Plateau Rosa (one of the highest points on the Cervinia slopes) which goes all the way down to the village. It seems to be a kind of iconic secret haven that everyone knows about but takes some effort to find. We stumbled upon it by complete accident. The owners are so lovely, and told us about how there used to be a chair lift right next to the restaurant and that's why it was first built. The chair lift was taken away, but the owner liked it's peaceful location, so he bought it. The area is blissfully quiet and you can enjoy the sun in splendid isolation. 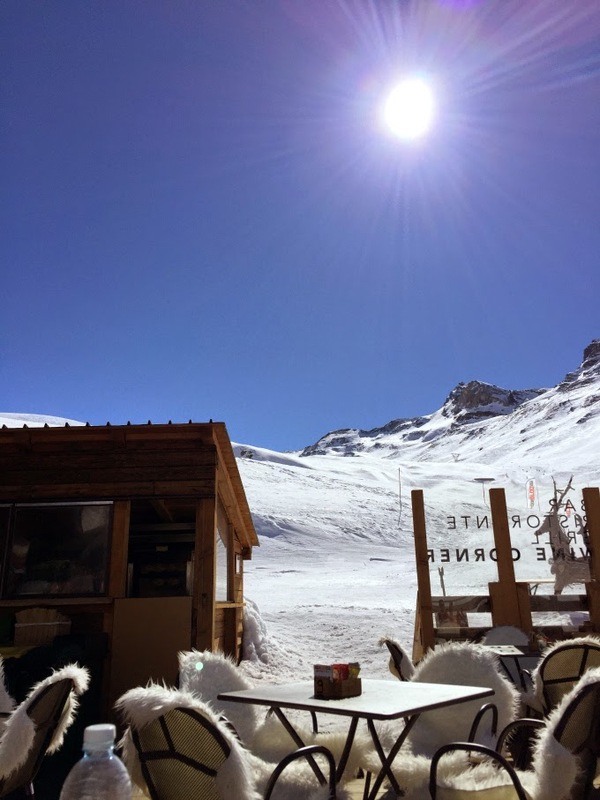 It was such a nice contrast to the usual mountain restaurants which have people heaving in and out constantly. I'm now so glad I got down the terrifying run because it lead me to such a gorgeous place (and looking back it wasn't actually that hard). The secluded area was magical, with a stunning view, warm people and a glorious entrance. 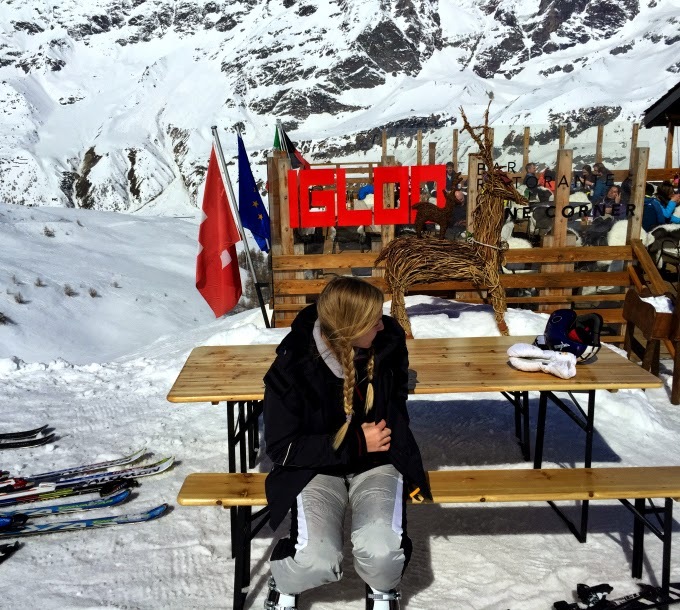 If you're ever skiing in Italy or Switzerland, make a point to track it down.